Silver Star, one of Burke Mountain's earliest builders, brings Millard Park. 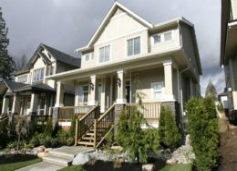 Millard Park is a collection of 11 homes, located near Burke Mountain's newly constructed Millard Park, and joining with Silver Star's other development, Meridian Heights. Completed in 2013, Millard Park features floorplans ranging from 3,641 to 3,657 square feet. Set on large lots, these homes have either 5 or 6 bedroom plans, and had the option to add a 1 bedroom basement suite. Features include wood trim, designer lighting, high end tile and hardwood floors, crown moldings, coffered and/or vaulted 9′ or 10′ ceilings, state of the art gas heating systems, and central vacuums. Millard Park by Silver Star Enterprises is now completely SOLD OUT.